Dave Chisnall and Michael Smith were eliminated from the 2016 Premier League following defeats in Cardiff. 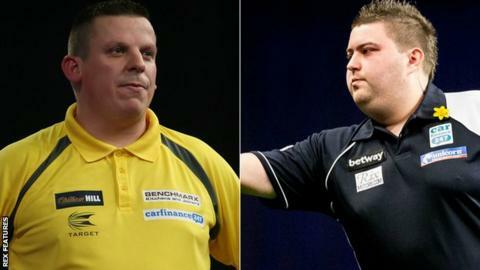 Smith lost 7-5 to 16-time world champion Phil Taylor, while Chisnall was beaten 7-5 by Peter Wright. Those results meant Robert Thornton, the only other man who could have exited the competition on Thursday, was already assured of a top-eight place before he lost 7-4 to Adrian Lewis. Taylor's win put him a point clear at the top of the table. Michael van Gerwen drew 6-6 with fellow Dutchman Raymond van Barneveld, a result which extended the world number one's winless sequence in the Premier League to three matches. Meanwhile, defending champion Gary Anderson's run of six successive wins was ended by a 6-6 draw with James Wade. Points gained in the first nine weeks of the competition will be carried forward and the remaining eight players will face each other once during seven further rounds of fixtures. The top four in the table after 16 rounds will qualify for the play-offs in London on Thursday, 19 May.